Russ Columbo was born Ruggiero Eugenio di Rodolfo Colombo on 14 Jan 1908, in Camden, N.J., the 12th and final child of Italian immigrants Nicola and Giulia Perseri Colombo. 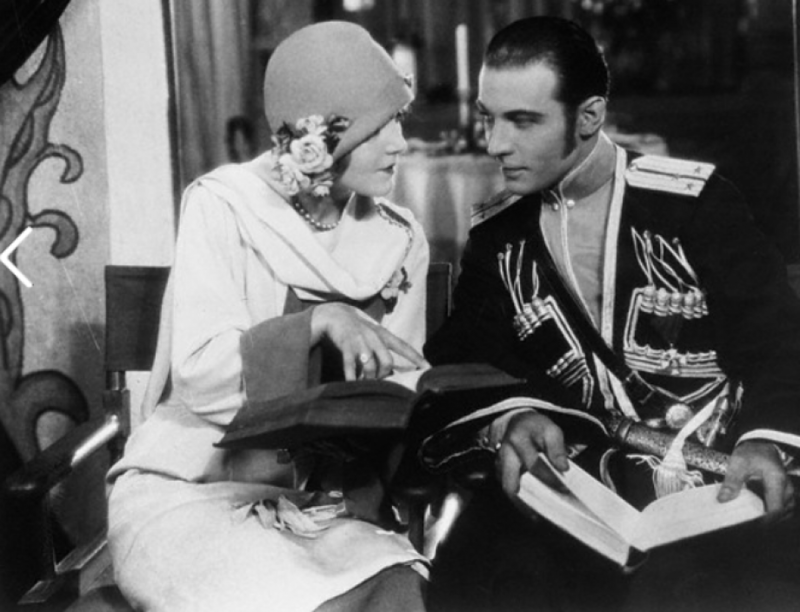 Rudolph Valentino was born Rodolfo Pietro Filiberto Raffaello Guglielmi on 06 May 1895 in Castellaneta, Italy, the middle child to Italian and French parents Giovanni and Marie Berthe Guglielmi. Their life’s journey took them to Los Angeles where both found their way into motion pictures and instant fame. Russ Columbo was “discovered” by Silent Film actress Pola Negri who was once romantically involved with Rudolph Valentino. Russ Columbo was grateful for the employment opportunity that Pola provided. He composed many love songs to her and sang them over the air-waves of the radio world yet romance was not on the cards for them. In 1926, Marion Davies had a conversation with Pola about romance. Marion Davies told Pola “there is no point in living like a nun. Come to my costume party dressed to represent the character you have most enjoyed portraying on the screen”. Pola Negri attended dressed in a Czarina costume from her movie “Forbidden Paradise”. The costume fitted perfectly and was all white and gold she looked like a queen. Rudolph Valentino disappointed in love attended the same party dressed in a matador costume from his movie “Blood and Sand”. Marion Davies costume party was a major success filled with the most famous movies stars of the day. The hostess was talking with a group of guests near the entrance to her home when she introduced her friend Pola to Rudolph Valentino. Pola recalls that exact moment “he was holding my hand and was taller than I imagined he would be. I felt as if my eyes were a camera focused on his life, and I remembered sharply all the things I read about him. That he was just separated from his wife Natacha Rambova. There was disillusion written all over his face. As if I saw him in a film now, he was motionless-stopped before me as suddenly as a heartbeat. I saw the hint of a dimple in his chin, his full sensitive lips partly opened. But his eyes held me they were wide set and so dark I could not see his pupils. My eyes met his and I thought you can hold me forever if you try. We danced a tango together and I was in his arms. I closed my eyes and we fell into the mad contagious rhythm. As if we had danced together always. We never missed a beat. The other couples on the floor stopped and watched us. The night seemed magical and I felt as though I was falling in love with him. The music stopped and without looking up again, without speaking I turned on my heel, and walked out of the ballroom to my waiting car and left the party. While walking up to my front door suddenly out of the shadows a man appeared and said why run away from something you know we both have tried to find all our lives. Before I could answer, I was in his arms”. There were rumors of an engagement, but it’s believed that Rudolph was looking for companionship and Pola was looking for publicity. On 23 Aug 1926, Russ Columbo was on the same movie set as Pola Negri. He was playing Dvorak’s Humoresque as background music and overheard the sad news, Rudolph Valentino just died so he stopped playing. Pola noticed there was no music and Russ Colombo was wearing a sad expression on his face. She asked what was going on and why did you quit playing? He told her the news and she fainted. Russ Columbo was asked about whether she fainted for real or publicity. Columbo said it was not faked but she truly did appear traumatic and was inconsolable over her loss. Months after his death, it was reported Pola Negri chose a tiger eye ring from Rudolph Valentino’s personal effects. According to Internet sources, Pola became deathly sick and it was said the ring was cursed. Supposedly, she gave this ring to Russ Columbo saying, “from one Valentino to another Valentino”. It is said, that the ring caused the untimely death of Russ Columbo from an accidental shooting.